Rotterdam Veterinary Hospital is equipped with a chemistry machine, a complete blood count machine,, viral and bacterial test kits and microscopes. 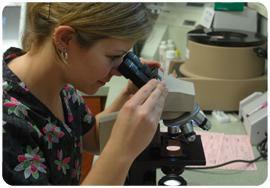 Many of our results are available for immediate interpretation in-house. For cases that require more specific diagnostic testing, we outsource to one of the nation's leading laboratories, enabling our Doctors to work directly with specialty doctors in order to provide complete comprehensive testing and assessment.